Campus Times Serving the La Verne community since 1919. La Verne came into the night riding a five-match winning streak while Cal Lutheran wanted to break its three-match losing streak. Despite the Regals’ losing streak, they were a fierce competitor for the Leopards throughout the sets. “We knew it would be a fight,” senior libero Kristen Sanchez said. The Leopards set the tone at the start of the first set with a kill by senior outside hitter Kelsie Sievers. Though the Regals weren’t playing with house money being in Leopards territory, they brought the noise and energy in this game. Cal Lutheran was able to gather a 4-1 lead on La Verne. Freshman outside hitter Haley Celaya’s kill brought the Leopards within two at 6-4 as they tried to get themselves in a groove. A service ace by Cal Lutheran gave La Verne a point to tie at 6-6. The Leopards and Regals traded points and kills as the Leopards fell behind to the Regals but worked their way back into the game with a kill by senior middle back Katelyn Winiecki on an assist by junior Madison Maynes. The Regals went on a 7-4 run that was capped off with a kill by sophomore middle hitter Taylor Johnson and a kill for the Leopards by Celaya to make it 18-14. On a Sanchez serve, Cal Lutheran returned the ball but La Verne could not connect to respond which led to the score 19-15. The Regals then went on a 4-4 run that was capped off with a kill by freshman outside hitter Jordan McArthur to make the lead 23-18 then an attack error by freshman right side hitter Samantha Landrum brought the set to 23-19. The Leopards rallied back into the game to have a shot at taking the set but the Regals held on to take the first set 25-23. In the second set, it was the same story for the Leopards and Regals. A Maynes ace gave La Verne an early 3-0 lead as the Leopards had upped their energy and came out aggressive. They held a 5-3 lead as the Regals stayed close and miscommunication on the play made it a two point game. The Leopards continued to lead the way as a block by Winiecki and junior outside hitter Darrah Jones gave them a 7-3 lead. 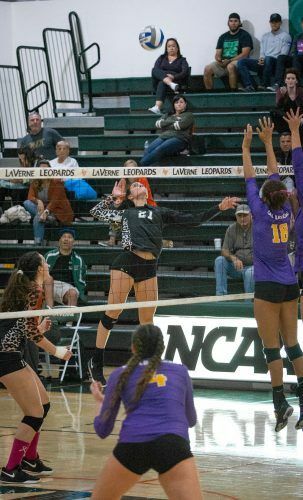 Celaya’s kill further extended the lead to 10-6 and Cal Lutheran was right on the Leopards’ tail as it was a 4-5 run for La Verne but the score was tight at 13-12. The Regals then tied the game at 13-13. Though the Leopards pried their way ahead, the Regals would not go away. The Leopards looked lost on one play that kept the Regals within one 18-17. A kill by Johnson tied the game for the Regals at 19-19. Cal Lutheran’s pesky play got them back into the game as it looked like La Verne would take the set. An overzealous kill by MacArthur gave La Verne a 22-19 lead. The Regals got the game within one on a kill by senior outside hitter Amanda Roberts at 22-21. Cal Lutheran eventually tied the game at 23 then took the second set from La Verne’s grasp, 25-23. Going off the high of the second set, the Regals came into the third set up, 3-1. La Verne fell back early but came back and tied the game at 9-9 on a Cal Lutheran service ace error on freshman libero Ashley Reyes. The Leopards did go up 14-12 on a ball handling error on the Regals. The Leopards’ lead was a bit comfortable as Celaya’s kill gave La Verne a 16-14 lead then she made another kill to extend it to 17-14. The Regals crawled their way back to take the lead, 19-18. Cal Lutheran stayed with the ball and La Verne could not answer. The Regals extended the lead 23-21 on a kill by Roberts. The momentum of the game did swing in Sievers and the Leopards’ favor as they tied the game at 24. La Verne fought with Cal Lutheran to the end but could not extend the game. The Regals won the set, 31-29. Jones said this game was a wake up call for team keeping their aggressiveness up and taking care of business. The Leopards travel to take on No. 2 Claremont-Mudd-Scripps at 4 p.m. Saturday. The Athenas beat the Leopards, 3-2, in their last meeting. Megan Hines can be reached at megan.hines@laverne.edu. © 2019 Campus Times. All Rights Reserved.